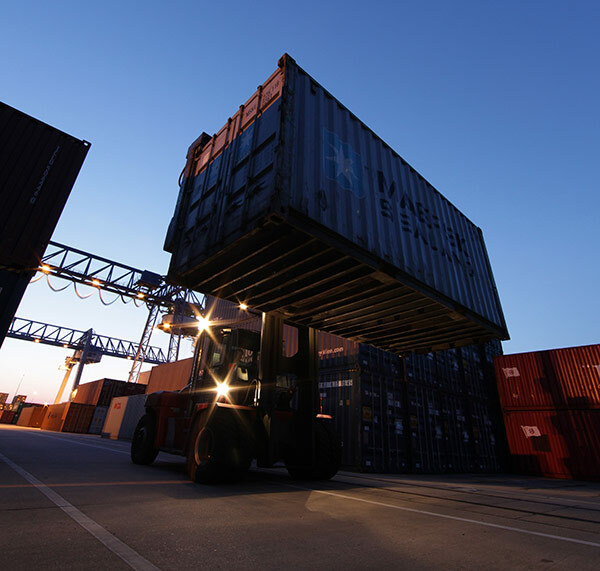 The Port of Emmerich offers a perfectly fine-tuned service package, including the organization of the entire logistics chain of pre- and on-carriage up to the overseas container transport. In addition to the excellent trimodal transport links, the container terminal and its customers benefit from the close vicinity to the Dutch border. The container terminal in Emmerich is closer to the major westerly Ports of Rotterdam and Antwerp than any other German inland port. From here, a trip by barge to Rotterdam takes less than 10 hours. And in only 14 hours, you are in Antwerp. There are multiple barge arrivals and departures from and to the Netherlands and Belgium each day. In addition, the port has its own rail connection to the DB route Arnhem-Oberhausen. And even during high water, the flow of goods continues without a hitch – the port of Emmerich is still open, even when other ports have already been closed for some time. During low water, the terminal can still guarantee a high capacity utilization for the ships. The modern port facility comprises a total of approximately 45,000 square meters all told. With a quay length of 250 meters there are two berths and two container bridges with a lifting capacity of up to 50 metric tons available for the transshipment of containers. We also provide reefer hookups for reefer containers. The Terminal Emmerich offers a perfectly fine-tuned service package: It comprises the organization of the complete logistics chain for the pre- and on-carriage up to the overseas container transport to and from the westerly ports of Rotterdam and Antwerp and the individual shippers. Our customers benefit from a personal bond of trust and a good value, the key ingredients for success.